Thinking about going vegan but wondering if you'll get enough iron? This nifty infographic by Vegans of Instagram gives you the lowdown on 22 different vegan sources of iron so you can begin your plant-based journey on the right foot. While most omnivores derive their iron from animal sources, the truth is there are many options for vegans. Good vegan sources of iron include beans and lentils, dark leafy greens, blackstrap molasses and fermented soy products. We should note that in order to ensure proper iron absorption you'll need to combine these vegan foods with those rich in vitamin C ( think mixed greens with pomegranate seeds). It's also a good idea to avoid tea when consuming iron-rich foods because it can inhibit absorption. Discover the iron-rich vegan foods you should be eating below. 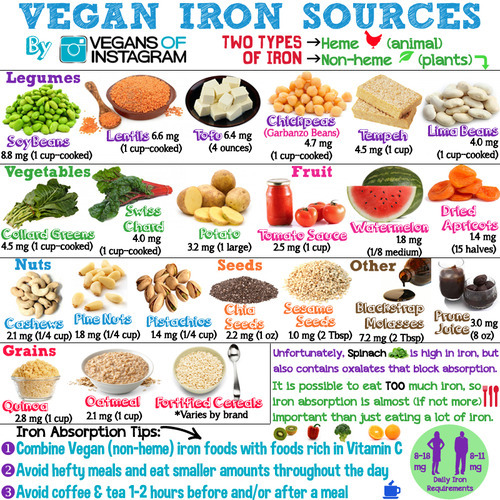 For more information on vegan sources of iron, consult these helpful graphs from The Vegan Resource Group.